You can assign a seasonal worker license to any employee to give them access to SmartVault temporarily from December 15th - April 30th. After April 30th, employees on Seasonal Worker licenses will be deleted from SmartVault and will no longer have access to your SmartVault account. Before you can invite a seasonal worker, you need to purchase a Seasonal Worker license. 2. From the Dashboard, click Employees. 3. Click the Add new employee icon to add a new employee. 4. 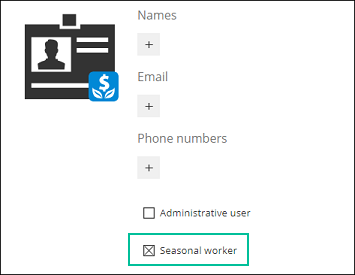 Enter the name and email address for the seasonal worker and enable the Seasonal worker checkbox. 5. Click the Save changes icon on the top left of the page. 1. From the Dashboard, click Employees. 2. Click the View employee info icon. 3. Click the Edit employee icon on the top left. 4. Enable the Seasonal worker checkbox.